Unveiled as a Halloween surprise on October 26, the Biscuits are the brainchild of Logan Arcade proprietor James Zespy, who by his own admission has "a collecting problem that borders on the edge of hoarding, with quite a backlog of weirder stuff." 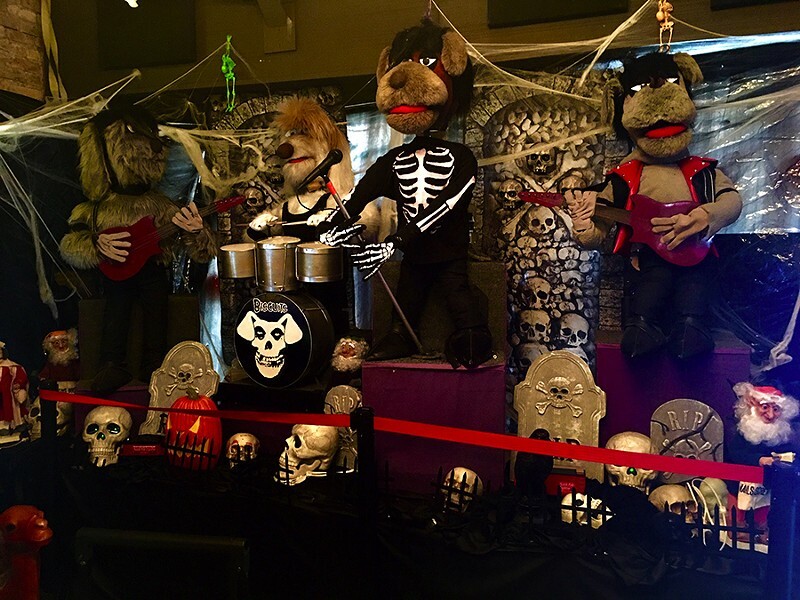 That "weirder stuff" included an original version of the Beagles, a canine animatronic four-piece that played in side dining rooms of Chuck E. Cheese restaurants in the 80s. 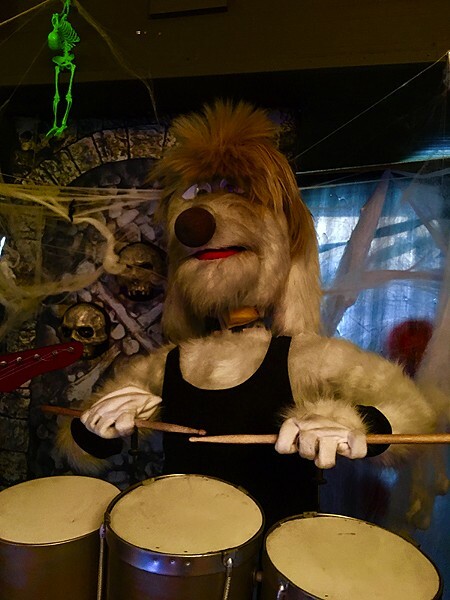 While the Rock-afire Explosion—the popular animatronic band introduced by Showbiz Pizza Place—played rock, pop, and country hits, the more modest, cabaret-style Beagles were all Beatles, all the time. "When I bought them, nothing was working and the technology was insanely old. The music ran off an old reel-to-reel player," Zespy remembers. "The hair had rotted in parts, and the faces looked like they had been nipped by rats—but the mechanical parts were there." Zespy, whose five-year-old son, Owen, is a huge Misfits fan, hired his friend Dave Vondle in early spring 2017 to rebuild the foursome into a mutant version of New Jersey's favorite horror punks. 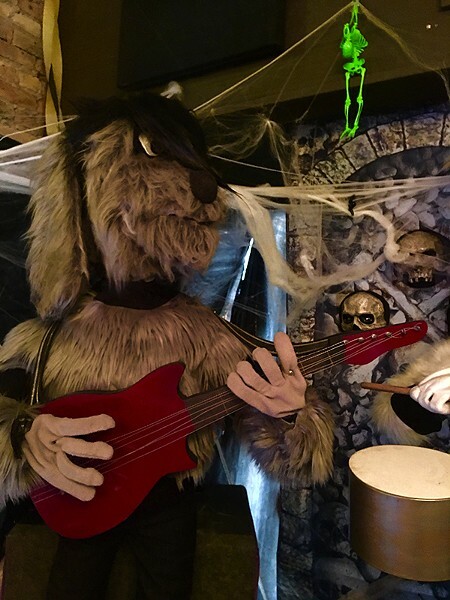 A lead designer at the Chicago outpost of multinational design firm Ideo, Vondle has a background in electrical engineering and had done work for the arcade before—and because he'd already attempted to hire the Rock-afire Explosion to play his wedding, he was the perfect partner. "Logistically, it ended up not working out," Vondle explains. "But Zespy remembered that story." For a few months this past summer, Vondle ended up making the Biscuits his full-time job, taking leave from Ideo to work on the reanimation. 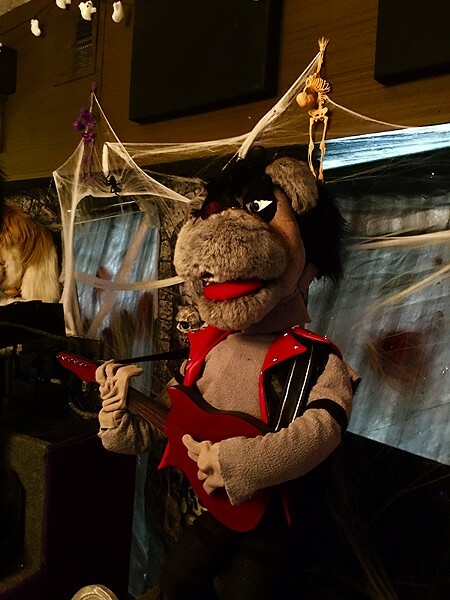 Within a week of his hiring, he'd programmed a first Misfits song into the original animatronics as a proof of concept, but then he decided he needed to deconstruct and rewire the band—a much bigger task. "It was one thing to get them working with all the old stuff," he says, "but it was not going to last. 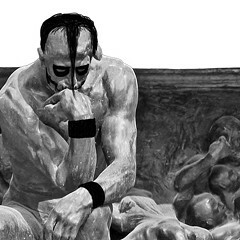 Once I knew what needed to be done, I was able to go back and make sure everything was up to snuff." 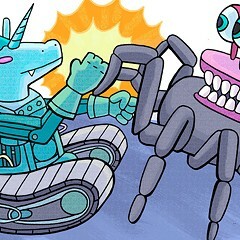 Vondle was excited enough about the project himself, but then he brought in an equally thrilled friend, Lex Huckabay, to redesign the characters and give them much-needed makeovers. She redid all the dogs' outfits from the ground up, including their hair and makeup. "Lex was watching old videos of the Misfits to make sure everything was period specific," Vondle says. "When I asked her about being part of it, she was like, 'OK, what era of the Misfits are we going for?'" Leading up to the unveiling of the Biscuits on the Friday night before Halloween, Logan Arcade made several cryptic posts on its Instagram account. And when they finally went on display, the response was pretty much what Zespy and Vondle had been hoping for. "It almost felt like a concert," Vondle recalls. "When we first turned it on, they played all five songs in succession. Everyone at the bar crowded around the stage." "It's my favorite mix of nostalgia and absurdity," Zespy says. "The best response anyone can have is, 'Oh my God, this is so stupid—I can't believe anyone made this.'" Currently the Biscuits are stationed just inside the arcade's entrance to the right, and they kick on every hour to play a couple of tunes. 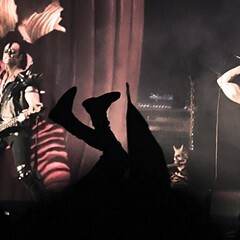 Their repertoire includes "Rat Fink, "Halloween," and "She"—as well as a version of "Mother" with reworked, on-dog-theme lyrics sung by the vocalist of a Misfits cover band. 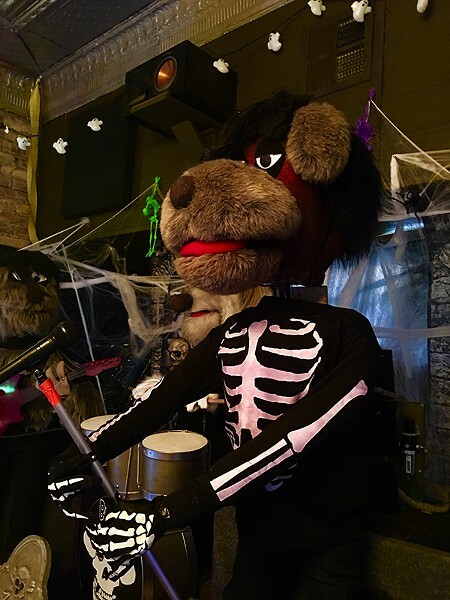 If you're just tooling around the bar or posted up unawares at a pinball machine in the front room, it's an impressive and flat-out bizarre surprise when the band springs into action—much like when the Rock-afire Explosion unexpectedly came to life at a Showbiz. And even if you are ready for it, it's still a spectacle. How long will the Biscuits' residency last? Zespy says it's open ended: "I don't know if it's going to be a McRib-style situation or what. If the novelty wears off, we'll tweak the band and bring it back a year later with new songs. As long as people still like it, it'll stay."